It's a fact. Most women got through labor in preparation for delivering the baby. But why is it happening and how do you know you are in labor? When the body is ready to push the baby out of the uterus and into the world, a series of changes occur in the brain and body. The brain releases signals that cause oxytocin and prostaglandins to enter the blood stream. These hormones cause labor contractions to begin. At first, many women relate the contractions to Braxton Hicks, gas, or common pregnancy pains, but soon the body starts rolling on a more regular pattern of pain and the scenario changes a bit. Labor begins differently for different women. In some it starts slowly, while in others it goes fast. 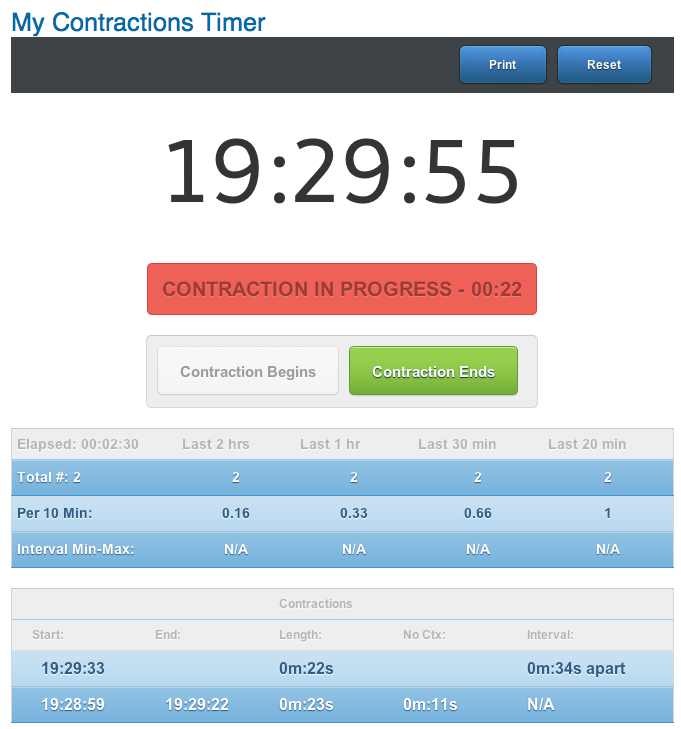 Go to the BabyMed Contraction Counting Tool and follow your contractions as you get closer to actual labor. It is important to note that labor contractions come in three forms: false, practice and active labor. Practice labor contractions is otherwise referred to as Braxton Hicks contractions and is common from week 20 until birth. False labor contractions can include a series of contractions that feel very much like active labor contractions but have no effect on cervical dilation and effacement. Active labor contractions occur during the birthing process wherein there is a cervical dilation of 4-8cm. Movement makes the pains stronger or more frequent. Labor pains increase in strength and frequency over time. Pains are accompanied by feelings of nausea of intestinal discomfort. Pain spreads to the lower back, upper abdominals and upper thighs. The mucus plug (which blocks the opening of the cervix and serves to protect the baby from bacteria during pregnancy) passes or bloody spots appear. If any of these signs accompany the labor contractions, the baby is on the way and the attending obstetrician or caregiver needs to be notified. Check the BabyMed Contraction Counting Tool and follow your contractions as you get closer to actual laboe.